Canvas Exchange™ is the innovative way to decorate your home using stylish, re-usable canvas art. All Canvas Exchange products are “peel and replace.” Apply decorative canvas from the sheet included in the kit to any smooth surface, in this case, your wall. Canvas Exchange™ is the innovative way to decorate your home using stylish, re-usable canvas art. All Canvas Exchange products are “peel and replace.” Apply decorative canvas from the sheet included in the kit to any smooth surface, in this case, your wall. Then, when you’re ready for a new look or want to decorate for a different occasion, simply peel off the canvas and exchange for different pieces. 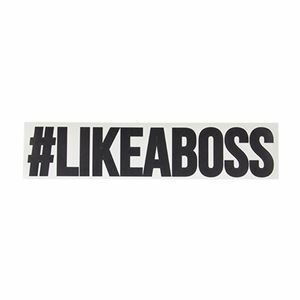 The Canvas Exchange sheet in this kit features #LIKEABOSS as individual letters.